For the past 20 years, my Boston-based practice has supplied content talent to Harvard Business Review and Fortune 500 CEOs, as well as more than half of the top 10 global management consulting firms, among others. On average, I turn away one in three prospects who get in touch requesting my services. Why? Many companies just aren’t ready to hire quality. Content marketing is a discipline that requires sustained commitment. When someone from a company calls me saying they are ready to hire a director of content marketing, chief content officer, or editorial director, I always ask to what extent they feel pressure to set up a content team to follow in the footsteps of competitors. I want to know if the move is genuine, or whether it’s about keeping up with their peers. What types of content projects do you envision? It’s important to figure out whether a company plans to publish product-oriented content or idea-oriented content. I ask for specific examples of what they have in mind. If they are coming out of traditional marketing, they’re programmed to think in terms of the 4 Ps, but I also want to know about “perception” and “proficiency.” Can they exhibit proficiency and knowledge, and in doing so build their brand as the smartest in that field? The only way to figure it out is to see whether they recognize the difference between product-based marketing and idea-based marketing. That shift requires a completely different mindset and skill set – a balance of rigorous critical thinking and storytelling expertise. For example, do they want to be news-driven and topical, or publish analyses of long-term trends. Do they want their content to have a social impact? Questions such as these indicate how deeply they’ve thought about their strategy. It also helps me understand whether they are interested in filling a content quota or making a lasting impact. Who is behind the hiring effort? Is it just the CMO who believes in the importance of the role, or is there a real commitment from the C-suite? I try to identify all the internal champions. If it’s just the CMO, any candidate I send will be doomed from the start. What resources will you put toward goals? Are you prepared to pay for quality? Excellent content creators do not come cheap. I hire from The Wall Street Journal, Fortune, Financial Times, among many others. They are not only excellent writers and editors, but they bring subject-matter expertise – and their rates reflect their experience. True quality comes more expensively. Are you ready to do the original research? I want to know whether a company sees the value of rigorous research to back up its subject-matter expertise. This may come in the form of original research, or in a partnership with a university or media company. If you’re publishing content devoid of research, you’re missing a big opportunity to distinguish yourself. 3) An archivist’s ability to curate and repurpose content. If your company has one of these rare creatures, hang onto them for dear life because rarity also implies that they will be in demand by others. But how do you keep top talent engaged when, realistically, great writers and editors often have little-to-no opportunity for advancement? I have seen a variety of ways organizations have addressed content talent retention. Content creators want to work for companies that have idea generation imprinted on the culture of the organization. One of my clients, for example, runs classes for consultants that help them to think like content creators. The company wants consultants, who are on the front lines of client engagements, to keep their eyes open to original ideas that can feed the content creation machinery. The same can be done in any company where employees have regular contact with their customers. It’s critical to help content creators become involved with more strategic decision-making. This may mean putting them on certain committees or involving them in partnership discussions. Allow them to “see over the wall” to a larger landscape. The better creators have intellectual curiosity, which when tapped properly can provide fresh eyes and innovative approaches to product marketing, new product development, customer retention strategies, and the list goes on. These are “creatives,” after all. Content creators should never lose distance with customers. I worked with a company that gave their content team a list of five customers each week who they were required to call. In these free-wheeling conversations, the team members used their journalistic skills to discuss customers’ needs, whether they were being met, and their perceptions of competitors. Honestly, the process was as important as the content. It helped the content team become much more engaged beyond their current assignments. They took their work more seriously and felt they had skin in the game. After years in management at Harvard Business Review, The Atlantic and Inc. magazines, Sara Noble launched her executive search practice. 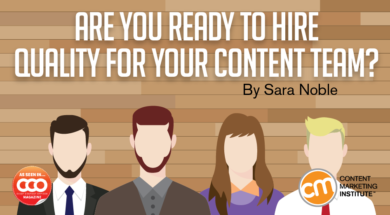 For the past 20 years, Sara has been the go-to recruiter in the thought leadership field, retained by the top-tier strategy firms, corporations and CEOs themselves, finding talent to improve branding with quality content. Connect with Sara on LinkedIn.